The race in Texas went about how I expected right up until the point when it didn’t. I’ve been incredibly lucky over 21 Ironman starts to have generally had pretty good luck. I’ve DNF’ed three races, twice where it was clearly the right decision – IMTX ’15 and IMAZ ’11 – and once where I still wonder – Kona ’13. In all those races where it’s gone wrong (including Kona ’13), it went wrong pretty early, and the struggle was really no surprise. The exception to that case was my lone mechanical, in Kona last year when my saddle broke. But on the body side, it’s usually pretty obvious quite quickly whether it’s gonna be a great day, a good day, or a bad day. When it’s a great day – like I’ve had on any of my ultra-distance wins, you know that almost immediately. And that’s nice, because it takes a great day where pretty much everything goes right to win an ultra (meaning a 6hr+ race, in my book anyway). I thought, for most of the week, that I was lining up for a great day in Texas. Training had gone well. I seemed to make the transition to Central Time pretty easily. Sleeping well. Final preparations in all three sports were great. I felt a bit unsettled after dinner on Friday night, but I did have a huge race looming. And I always eat a bit more than I “want” to eat the day before a race, since the caloric requirements are so high. So it was atypical, but not super weird, when I had to use the bathroom the night before the race. On race morning, waking up at 3:30 is always a shock. And I’m as nervous now – maybe even more nervous – as I was before my first Ironman. So again, it was atypical, but not totally abnormal, when I had diarrhea on race morning. Looking back, the one thing that was quite strange was that I thought, after finishing most of my breakfast, that I might throw up. Then again, if keeping calories down wasn’t so critical before an endurance race, I might be a lot more like James Hunt, who threw up before every race he did. I kept my breakfast down, though missed a bit of the calories I’d normally take. And that seemed to be it. I had another bout of diarrhea before the start, but I felt generally okay. As okay as you can with an Ironman looming. My stomach settled as I finished my final prep, and I didn’t think anything more of it as I got in the water. My left hip locked up a bit as I started to warm up, but your body does all kinds of weird things when you’re nervous and tapered and hypersensitive. I ended up swimming about as well as I expected given the number of strong swimmers that took the pace out fast. Out on the bike I felt like I had good legs. Not the best. But good enough. My hip loosened up from the swim, and I found a good pace. Watts were okay but hard to really gauge with 88 turns on the modified course. The flat and turn-y bike course definitely didn’t suit me, and I did myself no favors by leading a train of almost 20 into T2, but I figured that the heat would expose guys for whom that ride was just that little bit too hard. The course was the same for everyone, and I’m incredibly thankful that we had a course at all. While 88 turns in 95 miles on paper read like a disaster, on race day, the course flowed really well, and while it certainly favored the runners, you also saw enough blow-ups (and, thank you officials, penalties) that it was as fair as it could be. The Texas heat certainly exposed a lot of folks. Coming out of T2, I was stiffer than usual heading out onto the run, especially after only 3-1/2 hours on the bike. But everyone else was running way too crazy (except Patrick Lange, who ran crazy all day to go 2:40:01…), and I knew guys would come back. So I focused on staying cool, getting calories, and being steady. Right about where I thought guys would start coming back, they did. I had fallen to ninth, but midway through the second lap, I had moved back up to 4th. I was steady at 2:50 pace through 25km (about 15mi). But my hips were killing me. I felt like I was swinging two legs but they weren’t connected. I was muscling the pace. Every so often, I’d seem to find a good stride. But it never lasted. However, the pace was what I wanted. I wasn’t overheating. And it really felt like I was where I needed to be (in terms of getting to Kona) even if I wasn’t quite where I wanted to be (winning). Great days are usually easy. But I didn’t need a great day; I just needed a good one, and I thought I could muscle that out. Some days are just blue collar days that way. At certain points in the course, we had to make a hard U-turn, which was always a real struggle, and after making one around mile 15 or 16, it felt like an invisible wall dropped in front of me. My first instinct was calories. I started walking. First time ever in an Ironman. I grabbed two packs of blocs – my savior at IMAZ last year – and downed them. In started running again, at a slower pace, and shortly came to the RedBull aid station, where I asked for a whole can, again like at IMAZ when I bonked hard in the cold. I continued to slow jog, to try to let those calories clear, but I really just couldn’t find my stride. And even with the walking, my stomach wouldn’t clear. I walk/jogged a few miles and then I had to go to the bathroom. Badly. More diarrhea, which is totally normal during a race, but then when I wiped – a luxury when placing no longer matters – and saw blood. Quite a bit. I was scared. I thought I’d gone Julieanne White/Chris Legh. Except I actually felt pretty ok. Basically, i didn’t feel like I’d just killed part of my intestines. And, as I found out post-race when I checked in at medical, blood in stool is “totally normal”… At least within the context of something abnormal like Ironman. The doctor wasn’t worried. I knew hot weather can lead to intestinal permeability. It’s never happened to me, but I thought maybe with the cooler El Niño induced weather, I wasn’t as heat acclimatized as I thought. At first, I thought I’d just messed up preparation. Maybe my new approach to training really wasn’t any good. Maybe I need to stop writing about my “road to the woodlands.” Maybe I’d overdone it with all the turns and had ridden way harder than I thought by punching it out of the corners. Lots of things. All my fault. But then my mother said, “I had some GI problems starting last night too. And this morning was quite bad.” Dad? “Me too.” Ever since my “experience” at IMAZ 2011, I try to cook all my own food. And when I can’t, I try to eat as simply as possible. For this race, we had a VRBO place close to start, and I was able to cook all my own food. I’m good about washing my hands. But bad luck still can happen. It was actually a huge relief to know that it probably* wasn’t me. It was the sort of minor stomach flu that certainly wouldn’t have kept me from training. It might have made me back off a bit. But I really think it was the sort of thing that only becomes a problem when you try to do (most of) an Ironman in Houston. In May. When it’s really hot and humid. *I say probably because it still could have been entirely my fault. I don’t think so, but I won’t discount that possibility. The GI stuff made a lot more sense. My hip pain – and that feeling of being disconnected through my “core” (I hate that term) – made sense. The blood made sense. And that made thinking about “what next?” a lot easier too. It also makes me appreciate how lucky I have been the nine times I’ve been able to win an ultra distance race. I was asked at a Q&A the next day what I had to overcome on race day during those wins. And the answer is, basically, nothing. I’ve had stuff to overcome in life and in training. I’ve talked a lot about that. But on race day? When it’s good it’s easy. And when it’s not, it’s almost impossible to overcome a meaningful setback of any kind. And small problems also stack. With 180km of biking or a hillier course or fewer turns, maybe the race would have broken up enough that I didn’t feel I needed to run 2:50. On a cooler day, maybe the additional stress of hot weather on the gut would have allowed me to work through the GI stress of some stomach flu. In a less deep field, maybe I could have managed my output a bit better and finished okay. Or maybe not. Regardless, on this day, on this course, in these conditions, with this field, it was just more than my body could manage. And I think that’s to be expected. The difference between 1st and 2nd in my biggest “blowout” was just over 3%. Most races I’ve won, it’s about 1.5%. 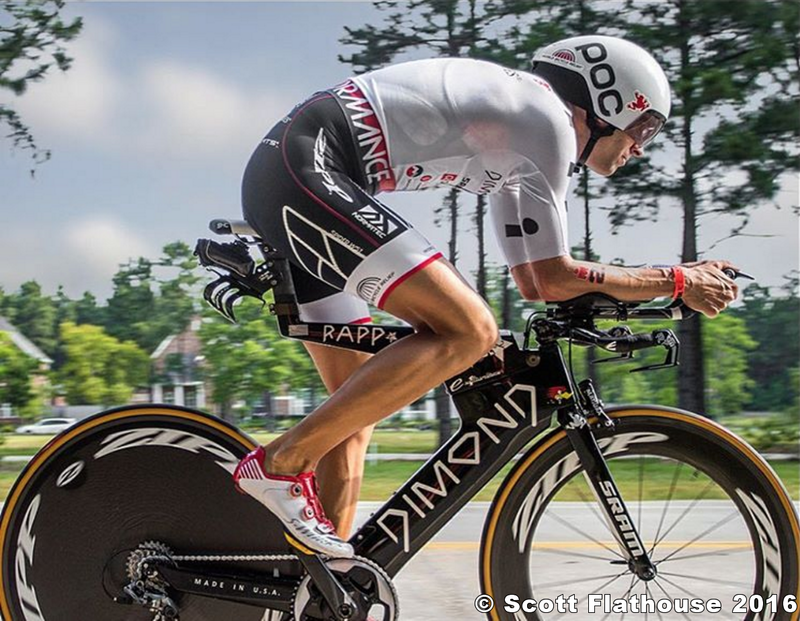 A “dominant” win might actually be only 0.5% – that’s about 3min in an Ironman. Simply put, the margin of error is really small once you start talking about high performance sport. Ben Horowitz wrote a book about his success at OpsWare. The title is the wonderful phrase, The Hard Thing About Hard Things. There was a lot that was management specific that is not really all that applicable to sport. But there’s also a lot that was applicable. And one of the fundamental truths is that while you can make a lot of your own luck through preparation, meticulousness, dedication, etc, you also need some of the old fashioned kind of four-leaf-clover luck as well. I didn’t have enough of that kind of luck on Saturday. But it makes me appreciate just how lucky I have been in order just to be able to be there racing. Sometimes you do pretty much everything right and things still don’t work out. That’s life. Get used to it. Time to get back to work. ← The Road To The Woodlands. Redux. Sorry to hear about the stomach issues. I've been a fan of yours since before I saw you win Canada in 2011. (I was a sherpa that year.) I loved hearing you say something about how not one of us has a burning desire to be typical. You were both magical and real in that talk. And today I read your Texas report. I'm sorry Texas wasn't all you wanted, but your perspective on disappointment is useful for an age grouper like me who spends all year preparing for one day. It's stressful to think that day could not go my way. If that happens, I'll come back to this post. Thank you for that. I hope I'll get to see you race again in the near future. And I hope the next one goes your way. Always been be a huge fan, really like the insight Jordan. BTW Sandberg made her commencement speech at UC Berkeley (Go Bears! ).